WELCOME TO MY MONEY MISSION ONLINE: GAIN "SNIFF SNIFF HURRAY" & MY BLOGSPARK GIVEAWAY!! GAIN "SNIFF SNIFF HURRAY" & MY BLOGSPARK GIVEAWAY!! I have always had a hard time finding a diswashing liquid that not only cut through grease and didn't fizzle out on me, but also was easy on my sensitive-skin hands. I have used every brand under the sun and wasn't too thrilled about any of them until now! I was given the opportunity, through P&G and MyBlogSpark, to try a bottle of the NEW Gain Dishwashing Liquid in “Original Fresh Scent." Since I like to try new things, I immediately opened the lid to smell it (very nice, crisp, clean scent) and poured a little in my sink to wash up a few stray pots and pans from dinner. Gain handled those greasy dishes very well, and they felt clean...no greasy residue on those pans! It also didn't make my hands feel dry and sore; that was a HUGE PLUS! As much as I really like the smell of the original scent, I am looking forward to trying their Spring Lavender scent (in the purple bottle). I was also pleasantly surprised to find that my 11oz bottle is lasting a long time....it only takes a little bit to do alot of dishes, and I don't feel like I have to squirt half of the bottle in the water just to get some suds. So, in my opinion, Gain's new dishwashing liquid is definitely worth the price and definitely going to replace all of the other brands that I have tried in the past. 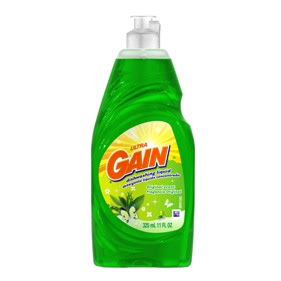 So, with that in mind, Gain and MyBlogSpark have offered 2 My Money Mission Online readers a prize pack of a Gain T-Shirt (size L only), and a $5 Wal-Mart Gift Card (to purchase your own Gain Dish Soap with). This giveaway is offered to US residents only, 18 years old+. Winners notified by email only, so be sure I have a way to access your email when you leave a comment! All entries must be received by 11:59 pm Central Time on October 9, 2010. The winner will be chosen using random.Org and will be notified via email. The lucky winners will have 48 hours to claim their prize. If no response, I'll pick new winners! Disclosure: I received no monetary compensation for this review. I received Gain product, t-shirts and Walmart Gift Cards from Gain and MyBlogSpark for review and was under no obligation from any person(s) or company to post a positive review. All information on Gain was obtained from literature sent to me or published online on their website. All thoughts and opinions are 100% mine. Aren't Giveaways so much fun??!!! Hope you are all having a wonderful Sunday!!! I'd try the apple mango tango. SonyaAnn...thanks for the email letting me know how you follow me...you'll get 6 extra entries! I'd like to try lavender. I became a follower of your blog on GFC. livingoutloud3(at)gmail(dot)com ~ I would like to try the Spring Lavender. Congrats on the cool giveaway! Aplle mango tango for me - sounds like it might make me think I'm on an island somewhere doing the dishes! I can't wait to try Lavender because it's one of my favorite fragrances :) *Thanks* for the giveaway! i want to try the apple mango tango. I am now a new follower number 101. I would most like to try the Citrus Splash! I'd like to try Citrus Splash scent.